These planes are by far the best planes we have found. Made out of the best materials and tested for excellent flights. They are sure to bring a smile to anyone who owns one. These are for all ages young and old. 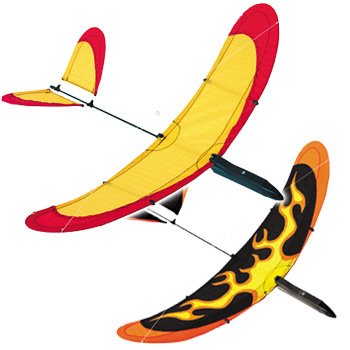 Throwing an Airglider plane will bring out the child in all of us! Take a look at the video to watch them soar and glide with an easy toss. They also look great decorating your ceiling when you don’t have time to play. Choose your favorite below or talk to one of our kite specialists at 1-877-234-8229.